We grow 2 blue poppies here. This one, Meconopsis grandis, is a couple of weeks earlier than M. betonicifolia. Between them both, flowering lasts over a month. They are easy to raise from the plentiful seed produced but a bit fussy as to where they like. Best here in an open, sheltered site (the leaves are easily broken by the wind). Elsewhere, they need woodland conditions and an acid soil that is neither too wet or dry. 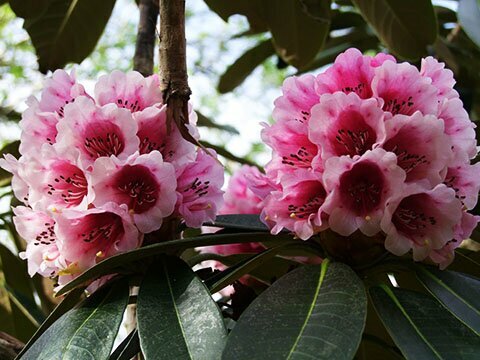 Rhododendron hodgsonii is one of a group of large-leaved rhododendrons grown mainly for their handsome foliage in the area known as "The Amphitheatre". The large leaves need a little protection from strong winds though they do better than might be expected in open positions here. Tall. 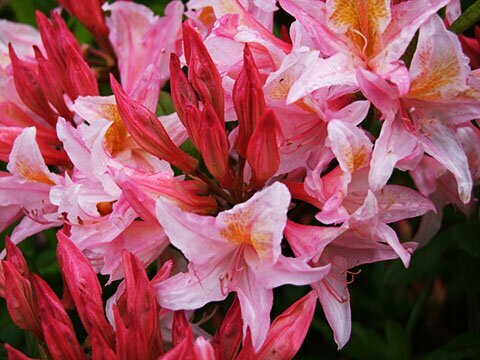 There are many azaleas in the garden and their fragrance on a still evening in early summer is wonderful. It is ok to have a small proportion without scent if the flowers are particularly good but ones like this "Irene Koster" and the fragrant yellow one, Rhododendron luteum, are the ones I like best. 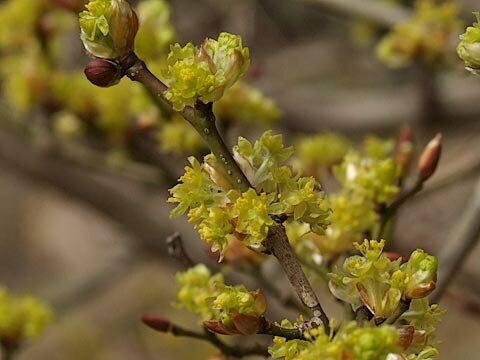 Lindera obtusiloba has fragrant yellow flowers on bare stems. The handsome leaves turn orange and yellow in autumn. Difficult to propagate from cuttings or layering. Grows to about 2m. Summer is the season for roses. These white ones on the house wall only flower the once but are worth seeing then. The pink one in the middle, "Mary Wallace", flowers less profusely throughout the summer. There are roses on several pillars though we only know the names of some. Species roses in the wilder parts of the garden are good at this time and often better in autumn with red hips. Rhododendron pachysanthum. 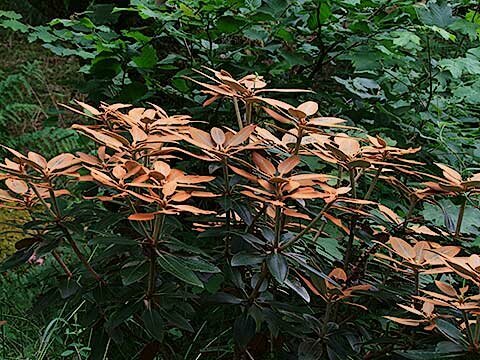 Although the flowers are quite pretty, it is for the new leaves that this rhododendron is grown here and the display lasts for months. Height about 1m. I think it is best planted, like this one, where dappled sunlight hits the leaves and the contrast between bright new growth and dark, old foliage is greatest. I have always liked erythroniums though the flowers do not last long. Erythronium "Pagoda" is one of the best and still flowers well when the bulbs become a bit crowded. 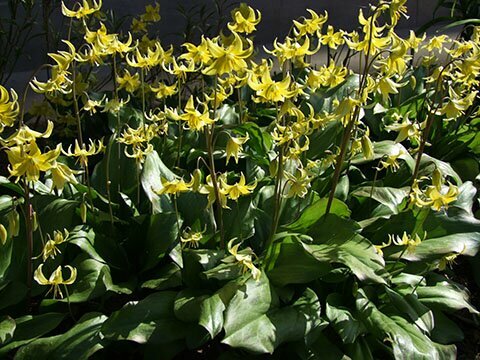 The "dog's tooth violet", Erythronium dens-canis does need regular spacing out or flowering becomes less. Bluebells are, for me, one of the best features of the garden and we try to encourage them where possible. Some areas are not mown till August when the seeds are ripe and the foliage has completely died down. Other areas are kept free of brambles and scrub so that the bluebells can be seen at their best. 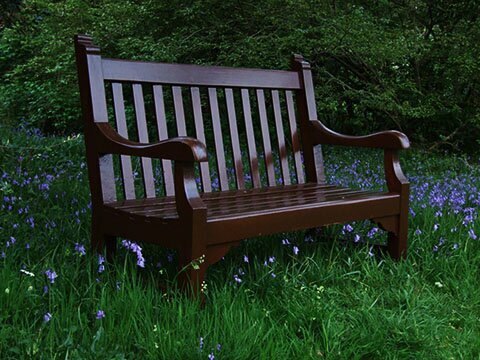 The seat here is one of several dotted about the garden so one can sit and admire the view. 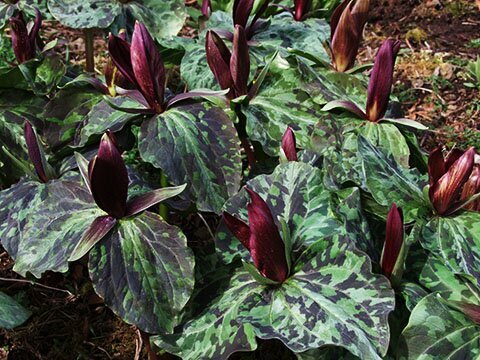 Trillium chloropetalum var. giganteum in Mrs Raven's 80th Birthday Bed. This bed was my birthday present to Mrs Raven and contains mostly plants I propagated. This trillium I grew from seed from "The Alpine Garden Society" along with Dodecathon poeticus and Disporum smithii. 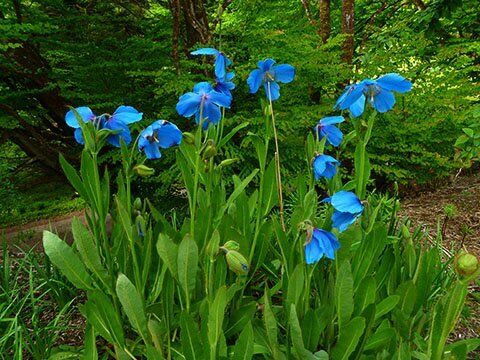 Also in the bed are meconopsis and lilies. I allow foxgloves to seed here in moderation. 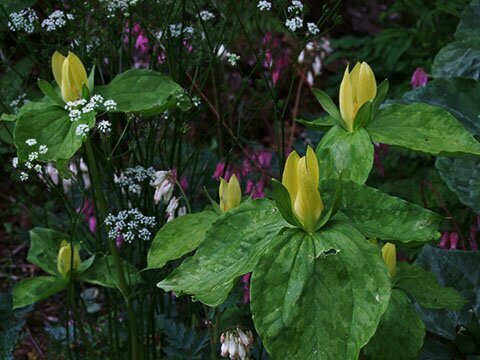 Trillium luteum in Mrs Raven's 80th bed has a lovely but delicate scent. This trillium has never set seed here so I have to propagate it by division. The white flower is the native pignut which I leave as groundcover among the trillium and dicentra. Pignut kindly dies back later making weeding easy. Summer. 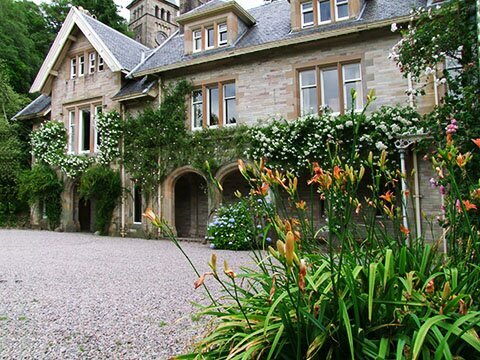 Warm weather and an abundance of flowers and scents greet us in early summer, particularly on a still evening. The trees are in full leaf, casting shade here and there. As summer progresses, flowering become a bit less but there is still much to appreciate in the garden. The huge leaves of gunnera act as umbrellas on wet or sunny days. Woodland walks in dappled shade on a hot day are soothing. Many wildflowers bloom at this time and there are dragonflies and butterflies to be seen on them. Hover over thumbnail images to give a full size view with description. Click the thumbnails to retain the image on the screen (exc Opera).